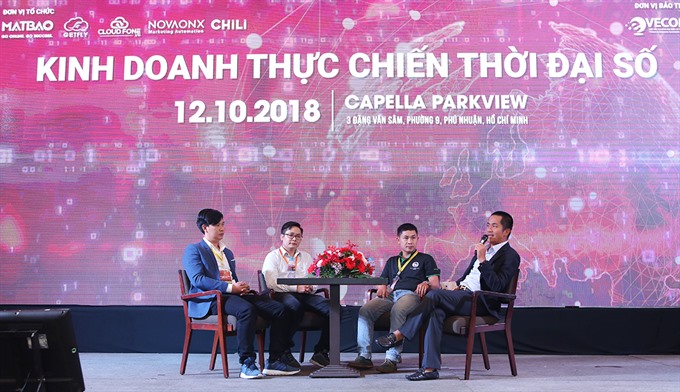 HCM CITY — In the future, the use of digital platforms by businesses will become a decisive factor in their success, delegates said at a conference in HCM City yesterday. Chu Ngọc Anh, president of Việt Nam Chief Sales and Marketing Officer Association, said the world was changing quickly and that disruptive technology had shortened the lifespan of companies. “The average lifespan of a S&P 500 company is now under 20 years compared to nearly 60 years in the 1950s,” he said. “Previously, information technology was defined as the use of computers, mobile devices and internet, but now, IT includes technology intelligence, including the Internet of Things, artificial intelligence, 5G, and machine learning. “Technology has become more pervasive, encroaching more and more on people’s lives, requiring businesses to invest in the right technologies to meet requirements of customers. “Otherwise they will lag behind,” Anh said. Nguyễn Phương Thảo from Nielsen Vietnam said the development of technology had changed customers’ shopping behaviour and habits. “Consumers now tend to shop online more, carefully learn about products they intend to buy before making purchases, and share their reviews on products and services. “Good reviews can help businesses a lot,” she added. Because of these trends, businesses should focus on developing better products and services to meet customer demand and apply effective solutions to approach customers. Many Vietnamese businesses are applying digital platforms to their businesses to increase their competitive advantage. But they have encountered challenges in doing so. He and Thảo agreed that the importance was not in how much investment they need, but in choosing the right solutions to maximize investment efficiency. “If they make the right investment, they will not spend much money,” he said. Another problem faced by businesses when they invest in digital technology is the number of solutions available in the market. “They do not know which ones to choose,” he said. Other domestic and foreign speakers at the event pointed out that most Vietnamese businesses lack information about digital platform tools, or have not combined them effectively, making the use of digital platforms slow and costly. They also shared new insights about the digital application process, including designing websites, building customer relationships management (CRM) systems, chatbots, building a foundation for digital marketing, and attracting customers with digital advertising platforms. Võ Thanh Mỹ, marketing director of Mắt Bão Corporation, one of the event’s organisers, said through the event, they hoped to bring useful information to businesses, enabling them to better combine digital platform tools that could help increase the number of customers and optimize customer services amid serious competition.